The sports betting industry is fragmented into Sharp and Soft books, and of course a mix in between. But what does this mean? We use a more precise term by referring to them as Asian and European books respectively - with Asian books being sharper than European ones. Soft bookmakers like the renowned Unibet, Betsson, William Hill etc. make use of a lot of traders within the company that use manual or semi-automatic odds movements to ultimately rely on gut feelings, knowledge and game statistics within the industry. They operate with high margins. They do not welcome sports traders and most of the time limit such customer accounts thus falling into the trap called a “false positive”. What if the person you just limited could have been one of your VIP Casino players? Soft bookmakers like these target mostly punters and gamblers and usually have other products to support their sports book such as Casinos, Poker, Bingo etc. The Sharp bookmaker model is based mostly on mathematical and highly efficient automatic risk management tools. They do employ traders as well to compile odds, however balancing their book is sharper and done with the help of mathematical models. Most of the time they are able to offer better prices in the industry, due to being faster and sharper than Soft bookmakers. Most of them also do not limit bettors and accept large bet stakes, thus they welcome traders and punters alike. Examples of such books are Pinnacle Sports, ED3688, SBOBet etc. Their profit is derived on smaller margins due to a huge turnover. Being a Soft bookmaker is becoming very challenging nowadays, considering that the Asian market is expanding at a very quick rate. Why would I place a bet on a Soft book for a much cheaper return (and also risk being erratically limited) when I could place a much larger bet at a much better price through an Asian book? In September 2010, I noticed that the strategy of laying home favourites in the German Bundesliga was consistently profitable, making this an ideal system for mitigating Betfair's Premium Charges. The rules are simple. Selections are those teams priced by Pinnacle at between 1.3 and 2.00. 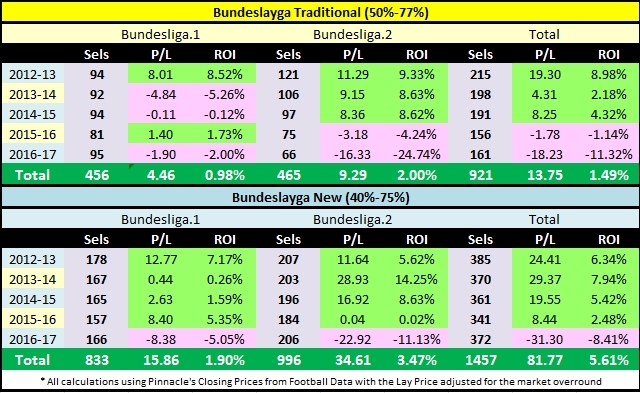 In the three full seasons of 2012-15, (prior to this there is no Pinnacle price data) backing the home favourite in the top European Leagues is a profitable strategy with an ROI of 3.93% from 434 bets, but laying home favourites in Germany has been profitable in each of those three seasons. Because the lay option is only available on the Exchanges, and Pinnacle do not offer a 'lay' price, the formula used in my calculations adjusts the home price depending on the Pinnacle over-round. For example a Home price of 1.51 in a Pinnacle Sports market of 102% is adjusted to 1.5395. ** Note that from 2016-17, the range has been adjusted. Please see this New Bundeslayga post for details. 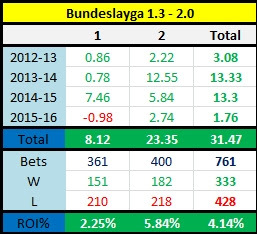 The basic Bundeslayga System layed teams priced by Pinnacle at between 1.3 and 2.00. 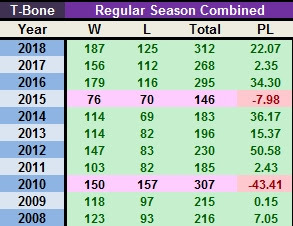 The results for the four seasons 2012-2016 are posted here, but with the addition of Pinnacle's closing prices to Football Data's spreadsheets, I took a fresh look at the approach and decided to tweak it for a couple of reasons. One was that the System was losing some of its potency - markets adapt, and my feeling is that much of the value of laying home odds-on selections was now gone (possibly in part my own fault for publicising this system). A second reason was to determine whether the 1.3 to 2.0 range was still optimal. Eliminating shorties and odds-against selections made it a simple system, but reviewing the closing price data shows that the implied profitability range of 40% to 75% is more profitable. 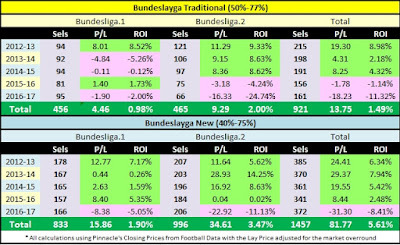 The table below shows the results of the Traditional Bundslayga and for the New Bundeslayga, using Pinnacle's Closing prices. I've left the original returns using the early scrape Pinnacle prices on this post which shows the difference that price movements can have on a system. Note that because the lay option is only available on the Exchanges, and Pinnacle do not offer a 'lay' price, the formula used in my calculations adjusts the home price depending on the Pinnacle over-round. 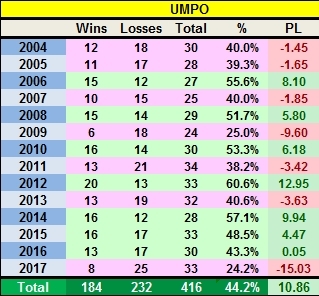 UMPO is an acronym for Underdogs MLB Play-Off and is a simple strategy which backs odds-against underdogs in the Major League Baseball Play-offs. Since 2004, (the first year for which I have data) it has been a steady winning strategy, and the following returns from a US site can generally be beaten on the exchanges making this an ideal strategy for mitigating Betfair's Premium Charges. ** Last Updated 9/30/18 to end of 2017 season. I'm also retracting the above comment that this is "an ideal strategy for mitigating Betfair's Premium Charges" because the 30 games a year this system generates is a drop in the ocean. "By always making the Kelly bet, your bankroll will increase faster than with any system." In Kelly's analysis, the smart gambler should be interested in "compound return" on capital. He showed that the same math a colleague (Claude Shannon) had used in his theory of noisy communications channels applies to the gambler. The gambler's optimal policy is to maximize the expected logarithm of wealth. Though an aggressive policy, this offers important downside protection. Since log(0) is negative infinity, the ideal Kelly gambler never accepts even a small risk of losing everything. Edge is how much you expect to win, on the average, assuming you could make this wager over and over with the same probabilities. It is a fraction because the profit is always in proportion to how much you wager. The edge is usually diminished by tax or commission. When your edge is zero or negative, the Kelly Criterion says not to bet. Odds is a measure of the profit if you win. In the Kelly Criterion, odds is not necessarily a good measure of probability. Odds are determined by market forces, by everyone else's opinions about the chance of winning. These opinions may be wrong, and in fact MUST be wrong for the Kelly gambler to have an edge. For example: The odds on Red Rum are 4 to 1 (i.e. the market estimates that Red Rum has a 1 in 5 chance of winning, or a 20% probability), but by your calculations, Red Rum has a 1 in 4 chance of winning (i.e. odds of 3 to 1, or a 25% probability). Assuming your estimation is correct, then by betting £100 on Red Rum you stand a 1/3 chance of ending up with £500. On the average, that is worth £166.67, a net profit of £66.67. The edge is the £66.67 profit divided by the £100 wager, in this case 0.67. The Kelly formula of edge/odds, is therefore 0.67 / 4, or 0.1675. This means that you should bet 16.75% of your bankroll on Red Rum. A quick search of the Internet will provide you with links to a number of easy to use Kelly calculators. Unlike some mathematical formulas, the Kelly formula does have the virtue of being easy to remember. By always making the Kelly bet, your bankroll will increase faster than with any system. However, gamblers need to understand that their progress and bank balance will not be a smooth upward slope, but will be interrupted by frequent drawbacks. For this reason, a common practice among investors and gamblers is to use the Half-Kelly bet. This greatly reduces the volatility of the Kelly bet, but returns 3/4 the compound return. For many gamblers, that is a price worth paying. It can be shown that a Kelly bettor has a 1/2 chance of halving a bankroll before doubling it, and that you have a 1/n chance or reducing your bankroll to 1/n at some point in the future. For comparison, a “Half Kelly” bettor only has a 1/9 chance of halving their bankroll before doubling it. For sports betting, there is the added complication that the true odds on an outcome are not known. When calculating your Kelly bet, your estimate may well differ significantly from the true odds. Both under-betting and over-betting will give you a reduced rate of return. Under-betting, which the Half Kelly is, will provide steadier growth, but with reduced returns, whereas over-betting can be fatal, as betting twice the optimal Kelly bet results in almost no long-term growth at all. In my opinion, most gamblers are probably best served by using a flat 2% of their bank per bet, since figuring edges in sports is, as mentioned earlier, very difficult. For a season-long win rate of 55% (on a bet paying at evens), a good target for most bettors, this represents a little more than 1/3 Kelly, which is a conservative compromise between risk and return. Increasing this to 3%, or occasionally 4% on an especially good play, is reasonable. More experienced gamblers, with a good understanding of the downsides of Kelly and an above average ability in estimating betting advantages, may wish to adopt the more aggressive Kelly approach to maximize their returns. 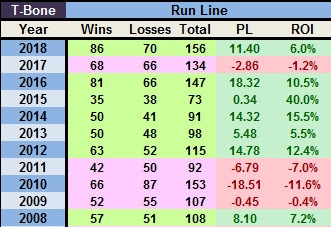 BLUnders (Big Line Unders) is a neat little system that I came up with in the Summer of 2015 when I was asked my opinion on NBA Totals betting in games where one side was heavily favoured. My gut response was that Unders was more likely to offer value, my thinking being that a team with a comfortable lead has a tendency to psychologically ease up, rest starters, and in addition the often crucial extra points from the fouling towards the end of a close contest are absent. I looked at the data for the last twenty seasons to see if this idea had any merit, and found that while the older data from 1995-2004 showed more equity between Overs (474) and Unders (480), the numbers since 2005 showed more of a bias (54.8%) towards Unders (487 - 402) and since 2010, even more of a bias at 56.5% (247 - 190). The number of qualifiers is a little under 100 per season, a very manageable number for a part-timer, although the 2015-16 season has seen an increase with the dominance of the Golden State Warriors and San Antonio Spurs having an effect. One additional note here is that the system is even more profitable in the play-offs. In the 20 completed seasons since 1994, the Unders has a 15 - 10 advantage. ** Update after 2015-16 season. For the fifth consecutive season, the system returned a profit, albeit lower than the previous four seasons. Not the sexiest of profits perhaps, but as I have said before, their value lies in the churn volume and the ease with which selections are determined. While the basic concept is easy to grasp and it sounds very easy to do, in fact trading has developed into quite a complex and tricky art, because people have designed bots and software to take advantage of the most obvious situations where trading should give you a profit. In addition there are people out there who manipulate the markets using “spoof” money, large sums which appear suddenly in an attempt to move the market in a particular direction. These can disappear as fast as they appear, but it is often not easy to tell the difference between spoof money and real money until it is too late. When trading you are swimming in shark-infested waters and you need to have your wits about you or you will get eaten alive. In the middle of February, without warning, Betfair fundamentally changed the way they matched bets. Did you notice at the time? Me neither, and while the ensuing storm of controversy has been hard to miss, the impact on your experience of using the exchange is likely to remain fairly minimal, in the short term at least. But betting exchanges are eco-systems. Some specialist users are very unhappy. So what's it all about? As a fully licensed and accredited idiot, I can offer you this idiot's guide. Introduced cross-matching into their system for handling unmatched bets on sports markets. Take a tennis match as the most simple example. There are just two possible outcomes, so any back bet on Player A is in effect a lay bet on Player B at the reverse price, e.g. backing A for pounds 10 at 2-1 is the same as laying a bet of pounds 20 on B at 1-2. Previously, if you wanted your tenner on A but no-one had offered to lay at that 2-1 or better, your bet would be left unmatched. After the February changes, the system would now attempt to cross-match, i.e. resolve your request with any appropriate unmatched back request on B. Betfair said "customer bet requests would stand a greater chance of being matched", and they were right. No problem - it's just fine for simple souls who use BF in broadly the same way that they use a bookmaker, i.e. one bet at a time, sweet Jesus. For traders - include anyone who factors into their strategy the unmatched bets on view - this unheralded change in the system is more problematic. At its most extreme, if you concern yourself with the pursuit of 'the pennies' - typically chasing under-rounds across whole markets or arbing individual outcomes - it looks like Betfair has just shot your fox. And BF were upfront about that. Retrospectively upfront, that is. "The motivation . . . is to reduce the load on the site by making it pointless for customers who use automated tools to bombard the site with traffic looking for arbitrage opportunities 'the pennies'." Risk-free money. Backing every outcome in a 99 per cent book; laying every outcome in a 101 per cent book; buying low, selling high. All that stuff. The pursuit of these pennies has driven the explosion in trading software, bludgeoning BF's systems with a massive volume of usage that yields relatively little by way of commission. As far as cross-matching goes, the pennies might appear in our tennis match example if there were unmatched back requests, e.g. player A pounds 1,000 at 2.02 and B pounds 1,500 at 1.98. Those two prices combined make a 100.01 per cent book - so you could lay them both to appropriate stakes and produce a tiny profit for yourself whichever wins. In this example, there's just over pounds 20 going begging (minus commission). Who's getting those pennies now? Betfair - or at least they said they might have "theoretically" got them for a bit. So far, a series of announcements has not done as much as it might to clear this matter up. Having initially failed to mention that they were cross-matching, Betfair then admitted to now potentially being in a position to trouser any spare money arising. That didn't go down well, so BF shelved the cross-matching process, for in-play markets at least, while they searched for a way to pass the controversial pennies on to customers through advanced 'best-price' execution in the new system. That is proving a tough technical nut to crack. Last Thursday, Betfair announced the reintroduction of cross-matching for in-play markets. They were quick to reassure customers that now "typically" cross-matching would only occur when there was no theoretical arb involved. Unfortunately, they also gave an example of such a no-arb situation: a 2.02/1.98 tennis match (see above). Does this cross-matching affect horse racing? No. Not yet anyway, and the non-runner issue looks hard to resolve, although there's always in-running. I'm a simple backer or layer - am I somehow getting stiffed by new sinister forces beyond my control? Are Betfair interfering in the market, and is that fair? You say potato, but they say potato (slightly differently). Betfair have certainly altered the mechanism of the market and hence its behaviour - the rest is complicated. And what's 'fair' got to do with it? Betfair aren't some happy-clappy club for punters - they are a fully licensed bookmaker, who define their own terms and conditions under the umbrella of existing legislation, with one objective. In the end, it's as simple as that, and only an idiot could expect otherwise. In sports investing, the Recency Effect means that the public have a tendency to place too much relevance on recent results, and with it, too much money, which of course means there is value on the other side. The p-value is used as an alternative to rejection points to provide the smallest level of significance at which the null hypothesis would be rejected. A smaller p-value means that there is stronger evidence in favour of the alternative hypothesis. Benford's law, also called the first-digit law, is an observation about the frequency distribution of leading digits in many real-life sets of numerical data. The law states that in many naturally occurring collections of numbers, the leading significant digit is likely to be small. For example, in sets which obey the law, the number 1 appears as the most significant digit about 30% of the time, while 9 appears as the most significant digit less than 5% of the time. By contrast, if the digits were distributed uniformly, they would each occur about 11.1% of the time. Benford's law also makes (different) predictions about the distribution of second digits, third digits, digit combinations, and so on. It has been shown that this result applies to a wide variety of data sets, including electricity bills, street addresses, stock prices, house prices, population numbers, death rates, lengths of rivers, physical and mathematical constants,and processes described by power laws (which are very common in nature). It tends to be most accurate when values are distributed across multiple orders of magnitude. It is named after physicist Frank Benford, who stated it in 1938, although it had been previously stated by Simon Newcomb in 1881. The Law of Large Numbers was established in the 17th century by Jacob Bernoulli showing that the larger the sample of an event - like a coin toss - the more likely it is to represent its true probability. Bettors still struggle with this idea 400 years on which is why it has become known as the Gambler’s Fallacy. Find out why this mistake can be so costly. There are some clear applications for expected deviation in relation to betting. The most obvious application is for casino games like Roulette, where a misplaced belief that sequences of red or black or odd or even will even out during a single session of play can leave you out of pocket. That’s why the Gambler’s Fallacy is also known as the Monte Carlo fallacy. In 1913, a roulette table in a Monte Carlo casino saw black come up 26 times in a row. After the 15th black, bettors were piling onto red, assuming the chances of yet another black number were becoming astronomical, thereby illustrating an irrational belief that one spin somehow influences the next. When he established his law, Jacob Bernouilli asserted that even the stupidest man understands that the larger the sample, the more likely it is to represent the true probability of the observed event. He may have been a little harsh in his assessment by once you have an understanding of the Law of Large Numbers, and the law (or flaw) of averages is consigned to the rubbish bin, you won’t be one of Bernouilli’s ‘stupid men’. The law of small numbers is a cognitive bias where people show a tendency to believe that a relatively small number of observations will closely reflect the general population. Read on to test your logical powers with the hospital quiz and find out how graphs can be misleading and what you can do to avoid losses when using stats to place your bets. In 1974 two psychologists, Daniel Kahneman and Amos Tversky, presented their experimental subjects with the following scenario, accompanied by a question. A certain town is served by two hospitals. In the larger hospital about 45 babies are born each day and in the smaller hospital about 15 babies are born each day. As we know, about 50% of all babies are boys. However, the exact percentage varies from day to day. Sometimes it may be higher than 50%, sometimes lower. For a period of one year, each hospital recorded the days on which more than 60% of the babies born were boys. Which hospital do you think recorded more such days? According to binomial theory, the number of days where boys born outnumber girls by at least six to four will be nearly three times greater in the smaller hospital compared to the larger one, simply on account of the larger volatility in birth ratios. A larger sample is less likely to stray very far from 50%. Yet only 22% of respondents gave the correct answer. Kahneman and Tversky described this error as a belief in the law of small numbers. More generally, judgements made from small samples are often inappropriately perceived to be representative of the wider population. For example, a small sample, which appears randomly distributed, would reinforce the belief that the wider population from which the sample is selected will also be randomly distributed. Conversely, a small sample demonstrating an apparently meaningful pattern – such as nine heads from 10 coin tosses – will cause the observer to believe that the population will display the same meaningful pattern. In this case the assumption would be that the coin is biased. The experience of perceiving patterns in random or meaningless data is called apophenia. A belief in the law of small numbers is part of a wider group of mental short cuts that people take when making judgements under uncertainty. Kahneman and Tversky called these short cuts heuristics. Making generalisations from small samples is an example of a representativeness heuristic, where people assess the probability of a particular event based solely on the generalisation of previous similar events that comes easily to mind. The heart of the gambler's fallacy is a misconception of the fairness of the laws of chance. The gambler feels that the fairness of the coin entitles him to expect that any deviation in one direction will soon be cancelled by a corresponding deviation in the other. Subjects act as if every segment of the random sequence must reflect thetrue proportion; if the sequence has strayed from the population proportion, a corrective bias in the other direction is expected. Sports bettors can be particularly prone to faulty pattern recognition through a misplaced belief in the law of small numbers. 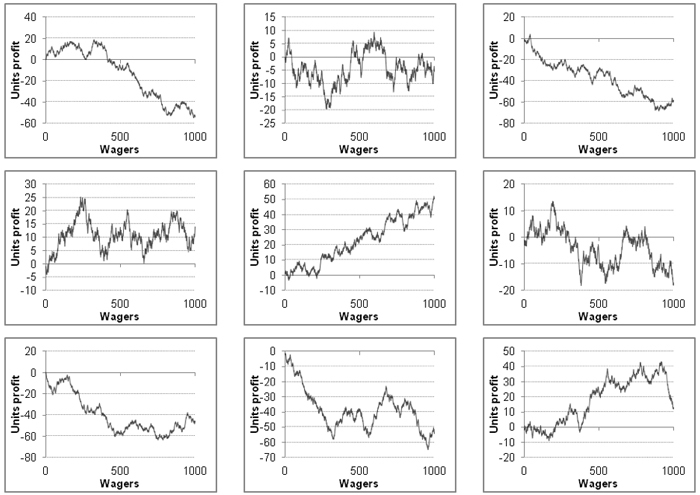 Misinterpreting profitability from small samples of wagers as representative of a departure from randomness and evidence of predictive skill can have unpleasant financial consequences over the longer term. Consider the hypothetical profitability chart of 100 wagers on NFL point spreads below. Each bet is struck at a price of 1.95. Impressive, isn’t it? What if I told you this record comes from a well-known US sports handicapper? With a decent growth trend and a yield of 15% you might be forgiven for believing me. Of course, I’m lying. In fact, the next chart of 1,000 wagers reveals the bigger picture. Really there was no long term profitability to be had at all. The reason: this was merely produced by a random number generator which assumed a 50% chance of an individual win and a profit expectation of -2.5%. The first chart simply represents the initial 100 wagers of the second. Yet even in the second longer time series a healthy profitability was maintained for several hundred wagers. Furthermore, despite showing an overall loss, the pattern of the time series looks anything but random, with a fairly consistent wave-like pattern to it. However, as Kahneman and Tversky recognised, we are far more likely to perceive sequences of similar outcomes as being non-random even if there is no underlying mechanism behind them. Of the two binary sequences below, which looks random and which not? The majority of people would pick the second sequence. In fact, the first was generated randomly in Excel and I made up the second purposely with shorter sequences of 1s and 0s. When asked to create random sequences like this many of us will switch from 1 to 0 or vice versa if we feel that one of them is happening too often. Now take a look at the following 1,000-wager charts. They were all randomly generated. The large range of possible outcomes should provide you with a flavour of just how easy it is to be fooled by apparently meaningful patterns. Remember, these are not series of 100 wagers, but 1,000. Take a look at the middle one. It has all the hallmarks of an expert tipster or bettor with a 5% yield and solid profit growth throughout the entire sequence of betting, the sort of performance the best handicappers are capable of long term. And yet it happened just by chance. Using the binomial distribution we can work out the probability of still being in profit after a period of betting despite having an expectation of -2.5%. After 1,000 wagers we still have over a 1-in-5 chance of being in the black despite our betting being nothing more than random. If we placed one handicap bet on every NFL game played, this would take us nearly four seasons. That’s a long time to believe we have anything other than luck on our side. The law of small numbers is a cognitive bias where people show a tendency to believe that a relatively small number of observations will closely reflect the general population. Furthermore, as this exercise has shown, small can sometimes be quite large. It exists because people favour certainty over doubt, explanation over ignorance, causation over association, patterns over randomness and skill (particularly self-serving skill) over chance. For sports bettors, failure to truly appreciate its significance can be costly. 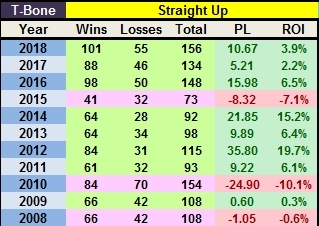 The T-Bone System (named after the person who came up with the original idea, although I suspect that isn't his real name) is a regular season baseball (MLB) system backing road favourites (-140 or hotter) coming off a loss, and was introduced in 2016. Here are the results over the past eleven seasons, updated to the end of 2018. Note that returns are all calculated using the US practice of risking the line to win 100 units when playing favorites, and risking 100 units to win the line when playing on underdogs. In probability theory, the expected value (EV) of a random variable is the weighted average of all possible values a random variable can take on. The expected value may be intuitively understood by the law of large numbers: It can be interpreted as the long-run average of the results of many independent repetitions of an experiment (e.g. a dice roll). Example: If you roll a dice, the possible outcomes are 1, 2, 3, 4, 5 or 6 – all with equal probability of 1/6. The expected value of a dice roll is 3.5. This example shows that the "expected value" is not a result that may be "expected" in the ordinary sense. Rolling a 3.5 with a dice (or having 2.5 children) is impossible. In trading, we can speak of EV as the estimated value of an investment with unknown return. A likelihood of 50% that we can sell the apple for $16. A likelihood of 25% that we can sell the apple for $12. A likelihood of 25% that we will not be able to sell the apple and it goes bad. (50% x $16) + (25% x $12) + (25% x $0) = $8 + $3 + $0 = $11. Thus, the expected value of the transaction would be $11 minus the $10 that we spend for the apple. The resulting EV of $1 is positive, indicating that doing the deal would be profitable, or "+EV". The return on investment in this scenario would be +10%. In many situations, the expected value of an investment can be estimated with thorough analysis. Differentiating between a positive result and a positive expected result is a key skill needed for every trader. A trade that made you profit might in fact have had a negative expected value. And a trade that made you a loss might in fact have had a positive expected value. Coming back to the dice example: you bet $100 on the result of a single dice roll being larger than 2. Obviously, this is a good bet. Still, the result might be a 1 – and you lose the bet. It also is obvious that you should not bet your life on the dice roll, even if your bet has a positive expected value. The potential loss simply is far too big. This is a good example that shows that you should not take any trade or bet, even if you have a positive expected value. This is one of the fundamental ideas behind money management. Do trades with a positive expected value, but do not invest more than 1-2% into a single trade. Otherwise, the risk of going broke despite making the right decisions simply is too large. The Lay Last Loser System is used in the top five English Football Leagues, and lays the last team to lose in each division until they win again. The idea was found on a post on the Betfair Forum and suggested excluding the Premier League and laying teams in their next two games. I have modified this to include the English Premier League and to keep laying teams until they win again. The reasoning appears to be that once a team loses, the market rates them higher than the team might rate themselves! Confidence is powerful, and a loss can quickly make a serious dent in it. In the world of gambling, secrets do not last long, and it is not always easy to tell when someone is bluffing. Those two maxims could weigh on the minds of editors at Simon & Schuster over the next year as it prepares to publish "The Smart Money: How the World's Best Sports Bettors Beat the Bookies Out of Millions." The book is said to be the true story of the Brain Trust, a group of professional gamblers that legally wagers hundreds of thousands of dollars in Las Vegas each week on college and professional football games, making it one of the most influential forces in the gambling world. The book's author was a participant in the group for seven years, first as a courier betting the syndicate's money, then as the operator of his own, smaller gambling ring affiliated with the Brain Trust. The proposal identifies him only as 44, an identity adopted, the author said, to protect the privacy of some of the participants in the gambling ring. Books about gambling have been hugely popular in recent years, and the proposal for "The Smart Money" reads like an edge-of-the-seat thriller, one made all the more intriguing by the likelihood that it is true. David Rosenthal, the publisher of Simon & Schuster's flagship imprint, and Marysue Rucci, a senior editor there, agreed two weeks ago to buy the book for an advance of roughly $500,000. Publication is scheduled for October. Simon & Schuster hopes to add an extra element of suspense by having the author wager some of his advance on the number of copies of the book sold in the first year: exceeding a certain number wins 44 a bonus, while falling short of the mark means the author has to return some of his advance. But both the publisher and the author face several potential pitfalls. While all gamblers lie sometimes, changing the identifying details in a purportedly nonfiction book leaves readers in the uncomfortable position of not knowing which parts are really true. And it turns out that the supposedly anonymous players in this gambling drama are, in fact, very well known. A few hours of Googling and database searching by a reporter led to the real identities of 44, the Brain Trust and its principal character. The author is Michael Konik, a freelance writer who worked for several years for Bill Walters, a Las Vegas developer who is one of the country's biggest sports bettors. The book proposal identifies the leader of the gambling ring as Rick Matthews, describing him as "the kingpin of American sports betting," a philanthropist, restaurateur and Southerner who, by dint of being "one of the greatest golf hustlers of all time," is "a millionaire several times over." Those descriptions make it relatively easy to determine that Rick Matthews is actually Mr. Walters, a Kentucky native who now spends much of his time developing golf courses in Las Vegas. In a telephone interview, Mr. Walters, whose gambling history has been explored many times in magazine and newspaper profiles, confirmed that he is Rick Matthews. For years Mr. Walters has run the Computer Group, a betting syndicate that uses computers to analyze reams of information on sports teams and players, placing enormous bets when it determines the point spread in Las Vegas books is out of line with its own calculation. Mr. Walters has been indicted at least three times in federal or Nevada state courts on charges of illegal gambling, but the indictments have been dismissed each time; he has never been convicted of any gambling charge. In 1999 The Las Vegas Review-Journal named him as one of the 10 most influential nonparticipant figures in sports. Mr. Walters and others also said 44 was Mr. Konik, a television commentator on poker matches for Fox Sports who has written extensively about gambling and golf. Among his several books is "The Man With the $100,000 Breasts and Other Gambling Stories" (Huntington Press, 1999), which includes a profile of a high-stakes golf hustler who is a thinly disguised Mr. Walters. Mr. Konik, reached at his home in Los Angeles, declined to discuss whether he was 44. Mr. Rosenthal, the publisher, also said he had no comment about Mr. Konik's relationship to 44. In an earlier telephone interview, arranged by his literary agent, Jennifer Joel of International Creative Management, the anonymous 44 sounded much like Mr. Konik. In the interview, the author said all the events to be described in the book were true and were based on an extensive journal kept during his tenure at the gambling group, from 1996 to 2003. According to the proposal, the author recorded in the journal his gambling wins and losses, brushes with the law and "the stunning sensation of actually holding $1 million worth of cash in my hands." But the author said he believed that he needed to change identifying details of people in the book because many of the participants in the gambling ring, as well as the peripheral characters in the casinos and elsewhere, are not public figures. As such, their abilities to sue successfully for libel or defamation are greater than they would be if they intentionally sought publicity. The author also said that while all of his gambling activities were legal, not everyone who knows him is aware of his gambling venture, and he would rather keep it that way. The details revealed in the book proposal, however, seem unlikely to allow that to happen. The proposal details the author's start-up of his own gambling circle, which he calls "the Hollywood boys" and which includes some well-known but as-yet-unidentified celebrities. Mr. Rosenthal, the publisher, said he did not think that the book needed an anonymous author to succeed. But so far, at least, he said he was willing to honor the author's desire to remain unknown. "He's not a C.I.A. station chief, but he has some specific reasons for wanting to keep his identity under wraps," Mr. Rosenthal said. "It's important to him, which I respect. But I think I could do it either way." Anybody who has played the office football pool knows how easy it is to fancy yourself an expert handicapper, and just how hard it is to outsmart the Las Vegas line. The matchups sit there like ripe fruit to be plucked. How can the unbeaten Bears be mere 10-point favorites against the lowly Dolphins? Then Rex Grossman throws three interceptions, the Bears lose three fumbles, and the Dolphins win easily. Add in the bookies' 10 percent commission – which means you have to be right more than half the time just to break even – and you get an idea why casinos are so profitable. Michael Konik knows these gut-wrenching ups and downs all too well. The magazine writer spent four football seasons as part of a gambling syndicate, an experience that taught him two lessons: Yes, you can outsmart the bookies. And no, it's not worth it. Not unless you possess ironclad nerves and a bottomless well of patience. You had also better know a programmer who can whip up an algorithm to pick the winners, because opinions and hunches make for sucker bets. Konik's introduction to this clandestine world came in 1997, when he met Rick “Big Daddy” Matthews. The legendary sports gambler recruited the scribe to work as one of the dupes who placed bets on behalf of Matthews' Brain Trust. Matthews needed the help because every bookie in Las Vegas had refused his business. So Konik showed up at Caesar's Palace and concocted a story painting him as a high roller who'd cashed a big advance for a screenplay. In fact, he was simply moving Matthews' money. But there was no such person as Rick “Big Daddy” Matthews, no such syndicate as the Brain Trust; both are names Konik made up. The New York Times and Las Vegas Review-Journal have reported that Konik's boss actually was Las Vegas developer and gambler Billy Walters, and the syndicate was known as the Computer Group. Konik floats through the first-season honeymoon in which he is entrusted with briefcases full of cash, gets a front-row seat on the action and enjoys the high-roller treatment at Vegas' poshest casinos. The money isn't bad, either. As one of Big Daddy's operatives, Konik keeps 10 percent of the winnings but risks none of the losses. But he operates under a constant cloud of suspicion: The bookies suspect that he works for Matthews, and any time he launches a winning streak, they limit his bets or close his account. Konik's girlfriend, tired of his gambling obsession, moves out. By 1999, with offshore casinos booking millions through the Internet, Konik moves his money online, but he finds that the bookies in Costa Rica and Antigua are even slipperier than his pals in Vegas. Konik deftly builds suspense throughout his fast-paced account, and it's not giving away too much to say that he finally decides that he's just not cut out to be another Big Daddy. Joseph Hobson Jagger (1830 – 1892) was a British engineer, widely known as The Man Who Broke the Bank at Monte Carlo, though he is not the only person to have done so. His name is sometimes reported as Jaggers, but the International Genealogical Index indicates that Jagger is more likely. Jagger was born in September 1830 in the village of Shelf near Halifax, Yorkshire. Jagger gained his practical experience of mechanics working in Yorkshire's cotton manufacturing industry. He extended his experience to the behaviour of a roulette wheel, speculating that its outcomes were not purely random sequences but that mechanical imbalances might result in biases toward particular outcomes. In 1873, Jagger hired six clerks to clandestinely record the outcomes of the six roulette wheels at the Beaux-Arts Casino at Monte Carlo, Monaco. He discovered that one of the six wheels showed a clear bias, in that nine of the numbers (7, 8, 9, 17, 18, 19, 22, 28 and 29) occurred more frequently than the others. He therefore placed his first bets on 7 July 1875 and quickly won a considerable amount of money, £14,000 (equivalent to around 50 times that amount in 2005, or £700,000, adjusted for inflation). Over the next three days, Jagger amassed £60,000 in earnings with other gamblers in tow emulating his bets. In response the casino rearranged the wheels, which threw Jagger into confusion. After a losing streak, Jagger finally recalled that a scratch he noted on the biased wheel wasn't present. Looking for this telltale mark, Jagger was able to locate his preferred wheel and resumed winning. Counter-attacking again, the casino moved the frets, metal dividers between numbers, around daily. Over the next two days Jagger lost and gave up, but he took his remaining earnings, two million francs, then about £65,000 (around £3,250,000 in 2005), and left Monte Carlo never to return. Jagger resigned from his job at the mill and invested his money in property. 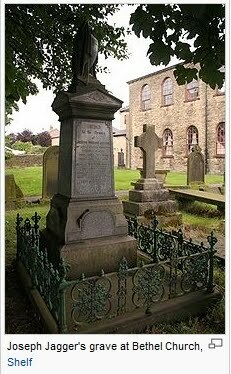 He is buried at Bethel Chapel, Halifax Road, Shelf.